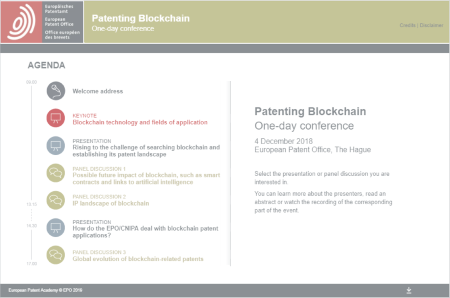 On 4 December 2018 the EPO hosted as the first major patent office a conference entitled “Patenting Blockchain”, an event designed to open a discussion around the impact of Blockchain on the patent system. The conference gathered over 300 representatives from industry, academia, user associations, patent law firms, the judiciary, national patent offices and government bodies. It provided a unique opportunity for open exchanges of views and for raising awareness on the technology itself and its many possible fields of application, on how patent offices such as the EPO and CNIPA (China) search and examine the patent applications, the role of open source and possible future considerations for litigation. The programme included lectures and panel discussions followed by Q&A sessions. If you want to find out more about the topics addressed in the event, have a look at the programme of the conference below.